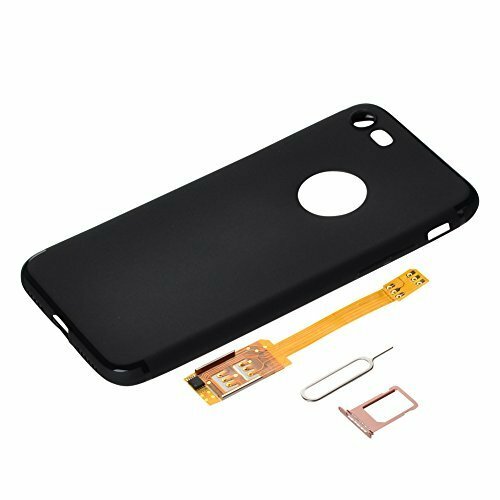 Dual Sim adapter kit two sim cards case/cover for iphone 7 -black color by BRIDGOR at Got Busted Mobile. Hurry! Limited time offer. Offer valid only while supplies last. *Installation: 1. Place normal SIM on the nano sim slot; 2.Place nano sticker side into metal card holder; 3. put nano SIM on the nano sticker; 4. *Installation: 1. Place normal SIM on the nano sim slot; 2.Place nano sticker side into metal card holder; 3. put nano SIM on the nano sticker; 4. Fold the flexible PCB abd insert into iphone 7 ; 5. Insert into side slot of iphone 7; 6. Put case on. *Instruction:(refers to the Instruction on the packing box) 1.Enter setting-phone-SIM applications, it shows "Q-SIM" menu; 2. "setup" menu provides the options * Notice Two SIM have to be from same network(4 G or 3G). Please restart iphone if no signal after switching .